« You’ve spoken, and we’ve listened! Open on Saturday!! At Kindness Pet Hospital, we take your companion’s oral health seriously. Just as poor oral health in humans correlates with systemic illness such as cardiovascular disease and kidney disease, the same is true for your pet. Dr. Connor has a keen interest in veterinary dentistry. She will examine your companion’s mouth and make recommendations for home care and a thorough dental cleaning under general anesthesia, as indicated. What is the difference between a dental cleaning, utilizing general anesthesia at my veterinarian’s office and a “non-anesthetic” dental? 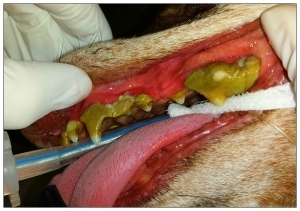 A veterinary dental cleaning involves a complete oral examination by a veterinarian, dental x-rays, a cleaning both above and below the gum line, fluoride treatment, localized antibiotic treatment for periodontal pockets if indicated, and optional application of a dental sealant to retard plaque attachment. An anesthesia free dental cleaning is a non-veterinary procedure where a pet is restrained awake, while the visible portion of some surfaces of the teeth are scaled (scraped with an instrument). This procedure does not clean your pet’s teeth thoroughly, leaving your companion at risk for progression of oral disease, and future problems. 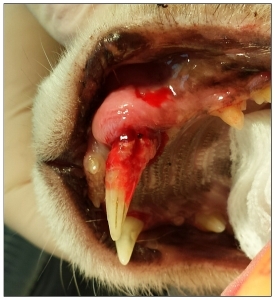 Please visit the links below from The American Veterinary Dental College for more information about veterinary dental health.